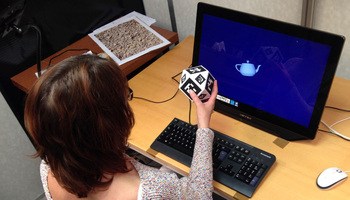 We evaluate the performance and usability of mouse-based, touch-based, and tangible interaction for manipulating objects in a 3D virtual environment. This comparison is a step toward a better understanding of the limitations and benefits of these existing interaction techniques, with the ultimate goal of facilitating an easy transition between the different 3D data exploration environments. For this purpose we analyze participants' performance in 3D manipulation using a docking task. We measured completion times, docking accuracy, as well as subjective criteria such as fatigue, workload, and preference. Our results show that the three input modalities provide similar levels of precision but require different completion times. We also discuss our qualitative observations as well as people's preferences and put our findings into context of the application domain of 3D data analysis environments. watch the conference preview video on YouTube.